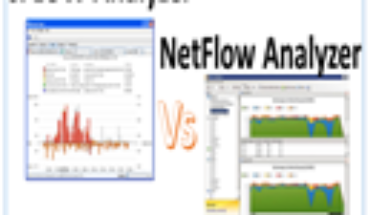 NetFlow is a network protocol developed by Cisco for collecting IP traffic information and monitoring network traffic. By analyzing flow data, a picture of network traffic flow and volume can be built. For each of the flows, NetFlow will track the number of packets sent, bytes sent, packet sizes and more. NetFlow data is sent from a flow exporter to a flow collector. Services and applications that serve as NetFlow collectors are designed to receive the NetFlow data sent from exporters, aggregate the information, and provide data visualization and exploration tool sets. Netflow mirrors all traffic, and places a load on the CPU when utilized. sFlow is a general purpose network traffic measurement system technology. sFlow is designed to be embedded in any network device and to provide continuous statistics on any protocol (L2, L3, L4, and up to L7), so that all traffic throughout a network can be accurately characterized and monitored. 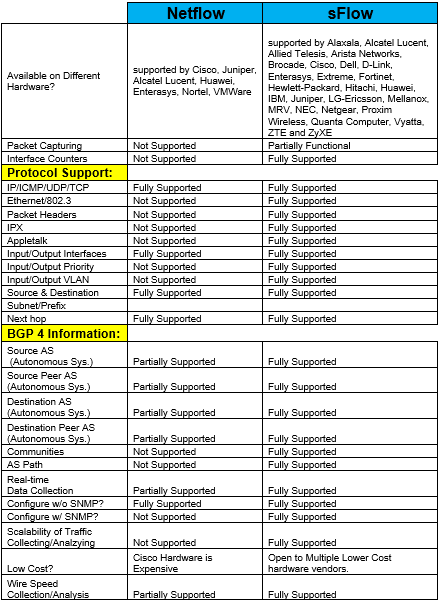 These statistics are essential for congestion control, troubleshooting, security surveillance, network planning etc. They can also be used for IP accounting purposes. sFlow is a packet sampling technology where the switch captures every 100th packet (configurable) per interface and sends it off to the collector. sFlow is built into the ASIC, and places minimal load on the CPU. Application level usage insight into Analyzing network and bandwidth. Supporting the detection of unauthorized network usage and network anomalies. Verifying whether QOS parameters have been implemented inline to application/users usage requirements. Analyzing new applications and their impact. With sFlow, packet forwarding information helps analyze the most active routes and specific flows carried by these routes in your network. Understanding these routes and flows creates a possibility for administrators to optimize routing and improve network performance. It doesn’t matter which type of flow technology you are using. As long as you use a network monitoring tool that supports both, IT administrators can focus more on how to manage your resources and optimize your network.